“All good things don’t go unpunished….” as the old adage goes. It never felt so true to me until this week. Over the holiday break, I turned 45 (wow), and on my birthday I baked several Swedish treats for my friends, loved ones and co-workers. (I only bake once a year). However, by the end of the afternoon, my lower back was out. Off to Falchi’s in the very cold rain. Eck. Luckily, most of the food stalls were open, and Don Tapas had a chicken tortilla soup that warmed my taste buds and my soul. Like most tortilla soups I grew up with, it was a spicy and savory tomato-based broth thickened with tortillas, and heaping with chicken, stewed tomatoes, onions, peppers, charred yellow corn, and spices. It was perfect for a cold, rainy day. The chicken salad special was way too big. It contained salad greens, lean, boneless/skinless grilled chicken (maybe not really grilled, where’s the char? 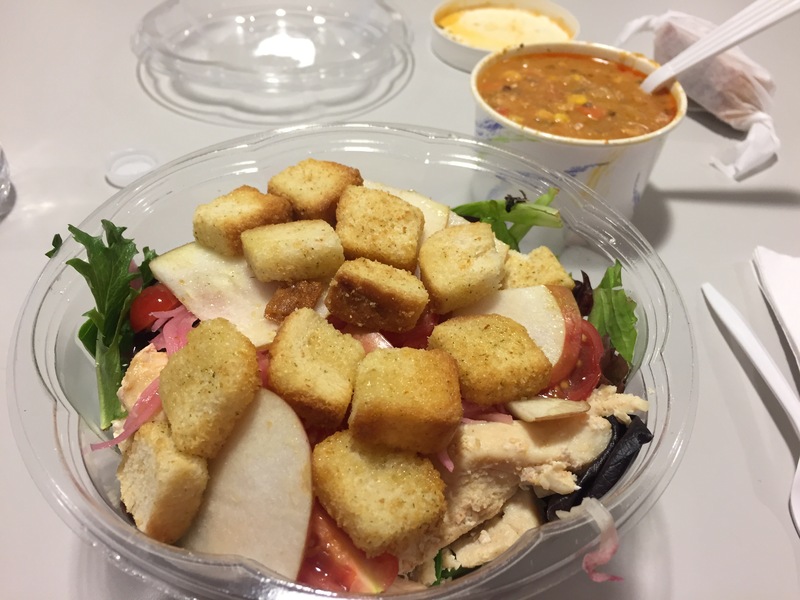 ), pickled onions, grape tomatoes, apples, croutons and honey mustard vinaigrette. Chicken was too dry, and there was too much of it. I am glad to be back at work, despite the pain.